A colleague, Jonathan Jay, found that recently the Circle Line Company unveiled a state-of-the-art solar and wind powered hybrid electric ferry to be named Miss Statue of Liberty. The company predicts it will bring a green revolution to transportation in New York Harbor. 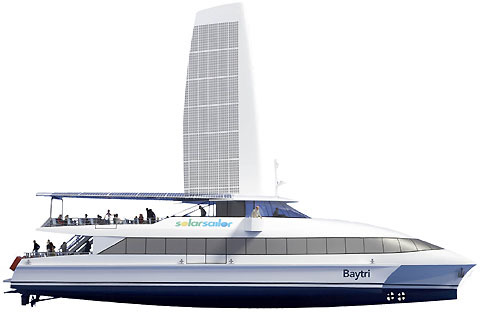 The 600 passenger vessel is being constructed in partnership with Australia's Solar Sailor Holdings Ltd. (www.solarsailor.com). This ship is like a hybrid car in that it determines the most efficient combination of energy sources to meet the task at hand. Here those sources include wind, solar, electric battery, and fossil fuels. This ferry will be able to achieve a maximum speed of 13 knots with diesel engines engaged. It will not only reduce water pollution, but will reduce overall air emissions and give zero emissions at slow speeds. A similar craft, redesigned for open ocean transport, could bring this green revolution to blue Hawaii. As oil prices soar, a solar-wind powered ship, such as the Solar-Sailer, has a chance of operating well into this century; not so the fossil fueled Superferry. Why couldn't the Hawaiian Superferry Corporation have a variation of this solar-wind-hybrid ferry that travels at a reasonable speed and carries hundreds of passengers? Because it won't carry a Stryker, Hummer or attack helicopter, that's why. In a month or so the Not-So-Superferry will start service to Kauai. There is no doubt that the Hawaiian Superferry Corporation business model is correct in one important respect: The future mode of inter-island traffic in Hawaii will be on the surface of the ocean. 1) By carrying vehicles the Superferry will degrade the quality of life on the outer islands. It won't take many vans and trucks to crowd Kauai's sweet surf spots, county parks, off-road trails, good fishing areas and camp grounds. 2) Any boat traveling at forty miles per hour is going to kill marine mammals as well as sea turtles. The leading edges of the Superferry cut like gigantic X-Acto blades through the water. It has been demonstrated that the ferry will not have the time to react to humpback whales surfacing from the depths, or calves swimming under but near the surface. 3) As it is, a Superferry weekend trip to Kauai, for a Honolulu family of four and their car, will cost $590. A Hawaiian Airlines rental-car /hotel package for the same family is only $480. The Superferry Corporation is already on the wrong side of the curve, and is not going to be a viable business when fuel costs rise past $4 a gallon. At 50% occupancy that is over $100 per person round-trip for fuel alone. No one planning the future of Hawaiian inter-island passenger service would design a ship that burned 5,600 gallons of fuel to travel the 110 miles between Oahu and Kauai harbours. The Superferry gets only 0.02 miles per gallon, so, even with 800 passengers that is still only 16 passenger-miles per gallon. For a comparison; Hawaiian Airlines flies 115 people on its Boeing 717s. They operate with a fuel efficiency of .44 mile per gallon. That comes to 50 passenger miles per gallon, or three times the people moving efficiency of the Superferry. So why would someone propose the Superferry in the first place, knowing it's a money loser? The reason is the ship was not designed for the civilian needs of the future, but for military needs. The Chair of the Superferry board is former Navy Undersecretary (during the Reagan years), John Lehman. Several of his navy and investment cronies also have board positions. Lehman's resume includes participation in the Heritage Foundation and Project for the New American Century. Both these Neocon thinktanks persuasively advocated the invasion of Iraq, as well as the lucrative no-bid subcontracts for service and support. A new and dreadful mix of military privatization and corporate interest was initiated. The Superferry is the linkage between these items. When needed, the Superferry will carry assault forces to training or into action. When not needed, the cost and maintenance of the Superferry will be a civilian responsibility; a new kind of public/private partnership. The Superferry was foisted on Hawaii to meet a new mission for the US military. That mission: To have civilian looking high-speed military transport, crewed by subcontractors, available at short notice to deliver assault troops and equipment, anywhere in the Pacific. The first ship of its kind was the Westpac Express. It is crewed by a subcontractor for the Third Marine Expeditionary Force in Okinawa, Japan. It was built by Austal, the same ship builder that built our Superferry. The two boats are virtually identical. The Westpac Express is indistinguishable from a civilian ferry, even when the marines and their equipment are onboard. Only when loading and unloading is it clear what its real purpose is. This is in part because the Japanese public is very negative to the US military presence in Okinawa. "The Westpac Express doesn't look like a military transport vehicle, but it gets the job done... this highspeed support vessel has given its crew the unforgettable experience of transporting marines and their equipment to wherever their next area of operations are in the Pacific ... Japanese navel officers didn't expect marines to be traveling on a vessel that looks like this." The civilian use of the Superferry is merely a cover to finance its military role. As a civilian transport the Superferry was underwritten and subsidized by the US DOT. Its business plan was guaranteed by the State of Hawaii and the Federal government. The cost of building the ship and all the harbor improvements were done without military expenditures. “With Lehman’s expertise, the Superferry plans to operate a Westpac Express, essentially to carry military equipment and ferry vehicles from Oahu to the Big Island on a daily basis.” Lehman told PBN that 'This logistical plan will make it easier for soldiers to train when the Stryker Brigade comes to Hawaii.'" Our Superferry was built for moving assault troops and their equipment anywhere in the Pacific. This includes Strykers, Hummers, as well as attack helicopters and howitzers. All of this equipment has weaponry that can use Depleted Uranium (DU) munitions. As you may know, DU is one of the causes of the Gulf War Syndrome that has disabled or killed thousands of Americans serving in the Gulf Wars. DU is uranium 238, which is a toxic radioactive metal having a half-life of 4.5 billion years. It is used as the tip of armor piercing shells. DU shells ignite in flight and are powderized on impact with a target. This creates a radioactive dust residue. This dust gets into the soil, or is carried away on the wind. It contaminates everything (people, places, things) it comes in contact with. Despite denials, there is evidence the US military use DU munitions in Hawaii and plan to continue using them. This year abnormally high levels of radioactivity have been measured in Kona, downwind of the Pohakaloa Fire-Range. One worry is that contamination from the Pohakaloa Fire-Range will be carried on Stryker Brigade equipment back into the Superferry and ultimately contaminate the civilian vehicles that use the same deck. These vehicles could then carry radioactive dust to every corner of the Hawaiian islands.